One of many awesome campsites this summer! 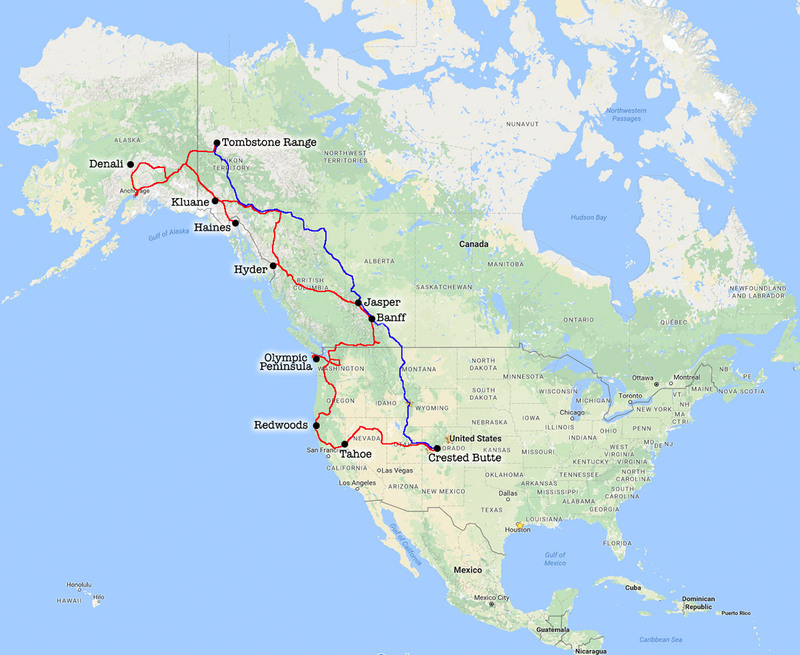 Our 12,000 mile route from Colorado to Alaska and back. Red is the way up; blue the way back. In June 2016 my wife Claudia and I took off on a summer-long road trip. Over the next 3 months or so we drove over 12,000 miles (19,000+ km), from Colorado to Nevada, northern California, Oregon, Washington, the Canadian Rockies, Yukon, Alaska, and back. 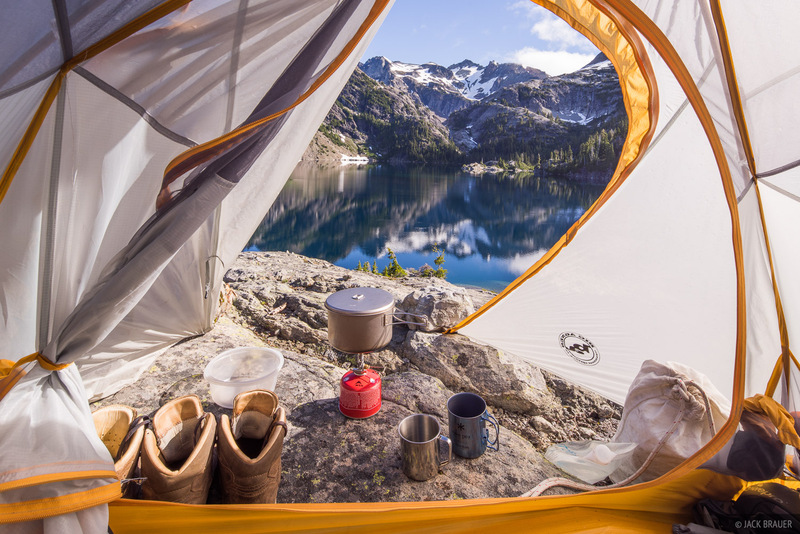 In order to keep costs down – and just for the fun of it – we camped as much as possible along the way; in fact, over the course of the three months on the road we rented hotel rooms only four times, and stayed with relatives twice. So, we ended up camping about 90 days in total, either in the back of our Toyota Tundra or in a tent while backpacking. I made a point of taking a camping picture [almost] every day, and here are all these photos. Some of them are creative and some are purely documentary, but as a whole I think they give a good impression of how we lived over the summer, and how much outdoor time we enjoyed! Posted in Alaska, Backpacking & Trekking, Road Trip 2016 and tagged Alaska, California, Canada, Canadian Rockies, Nevada, Oregon, Washington, Yukon on November 7, 2016 by Jack Brauer. Sunset view of Berg Lake, Mount Robson (right) and Rearguard Mountain (left). 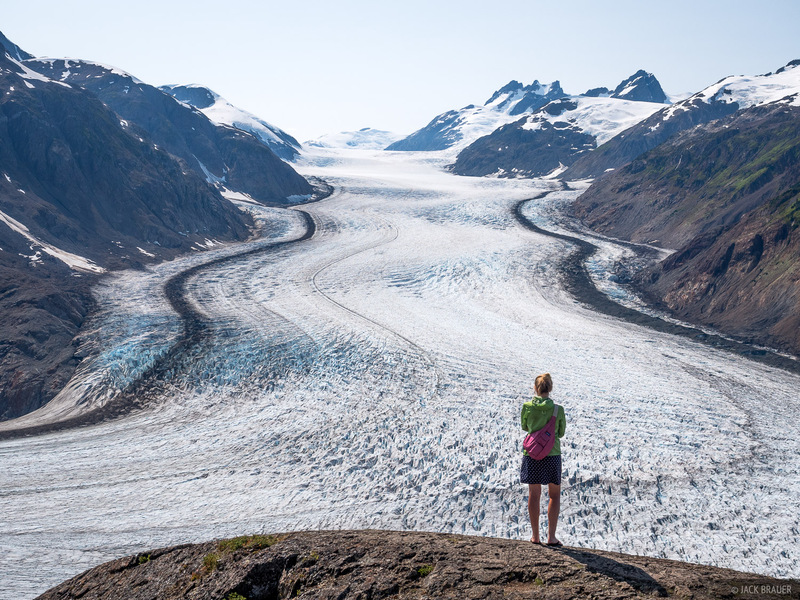 The Robson Glacier is visible in the left valley. 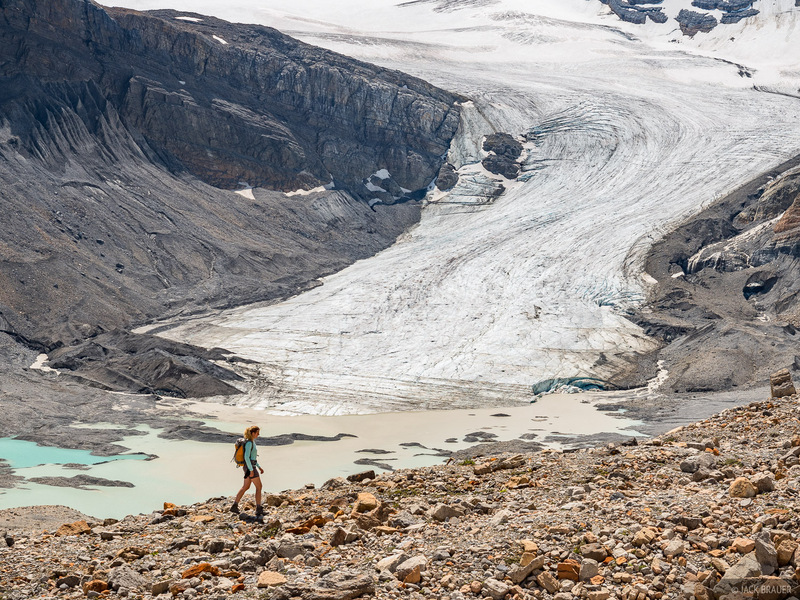 The trek to Berg Lake and Mount Robson is one of the most famous backpacking treks in the Canadian Rockies, and one that was high on our backpacking wish list. But when we drove through Jasper on our way north in July, we were disappointed to discover that the backcountry permits there were 100% reserved. Later in September after our trek in the Tombstone Range in the Yukon, we checked again online and were stoked to finally be able to reserve some available permits to backpack to Mount Robson. So after five days straight driving down from Dawson in the Yukon, we found ourselves back in the town of Jasper again, this time ready and able to go backpacking! 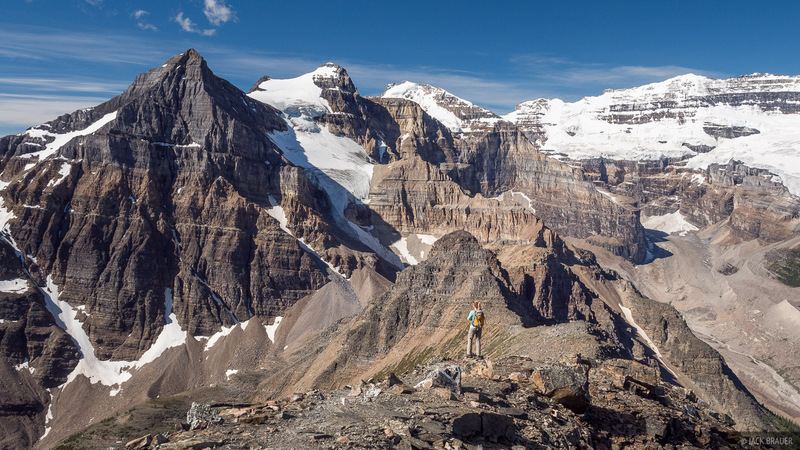 At 3954m / 12,972 ft., Mount Robson is the tallest peak in the Canadian Rockies. The mountain is massive, rising abruptly over 10,000 vertical feet from the trailhead, and over 7,500 vertical feet directly above Berg Lake. Robson and some its neighboring peaks are so huge, rugged, and glaciated that they wouldn’t be out of place in the Himalaya! We spent four nights out there below Robson — the first night at Emperor Falls campsite, then three nights at the Berg Lake campsite. From our “basecamp” at Berg Lake we did some awesome day hikes to Hargreaves Lake, Robson Glacier, and Snowbird Pass. Posted in Backpacking & Trekking, Road Trip 2016 and tagged Canada, Canadian Rockies, Mount Robson on September 12, 2016 November 7, 2016 by Jack Brauer. A spectacular sunset on the tundra of the Tombstone River valley, with Tombstone Mountain behind. Yukon, Canada. 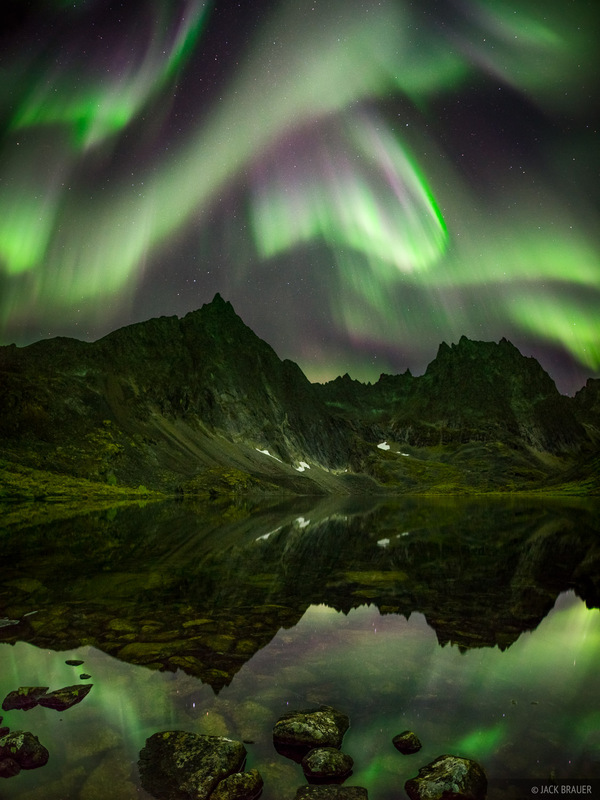 A spectacular aurora display reflected in Grizzly Lake. 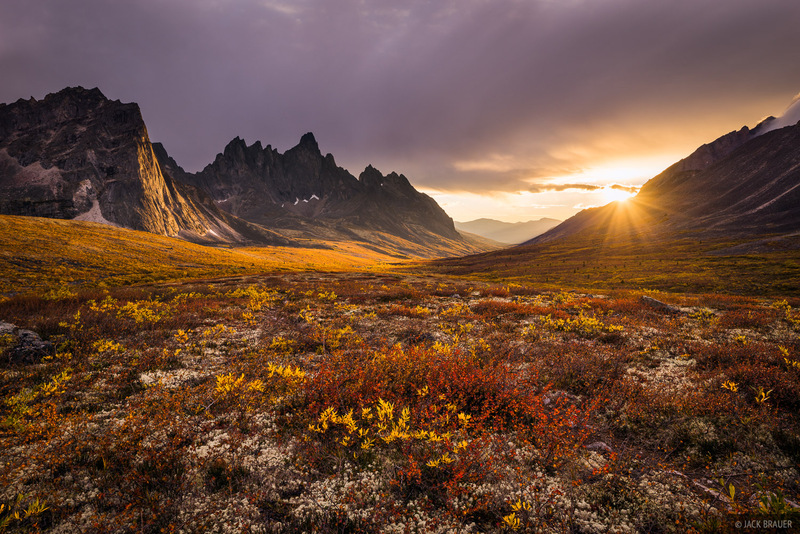 The Tombstone Range is a small but spiky mountain range located in the northern Yukon in Canada, almost up by the Arctic Circle. I have been dreaming of visiting and photographing these remote mountains since I first saw some photos of them almost 20 years ago. Because I’ve wanted to see these peaks for so long, and because this was the furthest point north we’d be traveling on our road trip, this trek would be both figuratively and literally the climax of our summer’s travels! As I wrote about previously, rainy weather forced us to hang out for almost a week along the Klondike before we had decent enough weather for backpacking. But the wait was totally worth it; we enjoyed seven days of great weather, amazing sunsets, and lots of aurora activity during our trek! Posted in Backpacking & Trekking, Road Trip 2016 and tagged Canada, Tombstones, Yukon on September 1, 2016 November 7, 2016 by Jack Brauer. 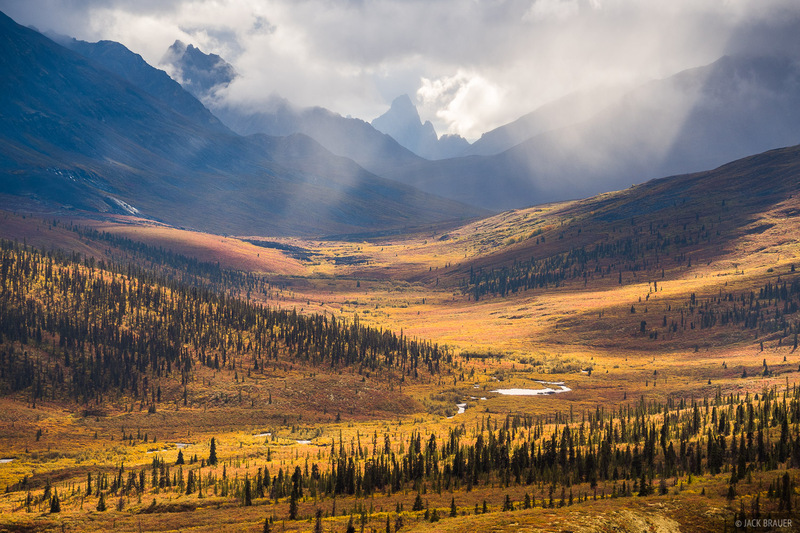 Light shines on the autumn tundra of the North Klondike River valley, with Tombstone Mountain towering in the background. Tombstone Territorial Park, Yukon, Canada. 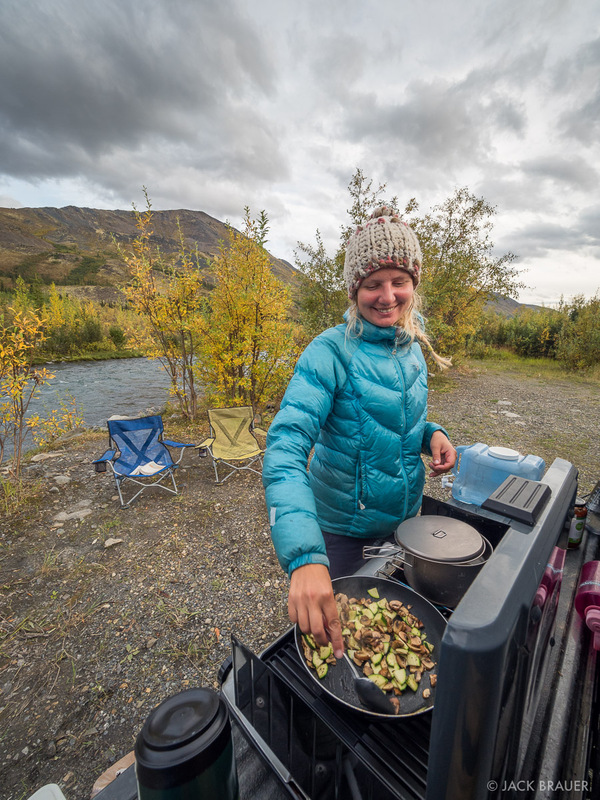 After our one-night backpack trip near Denali in mid-August, we faced a weather forecast of nothing but rain and dreary weather in Alaska for the foreseeable future. Frankly by this point on our trip I was getting pretty tired of this game of driving long distances and dodging rainy weather. So we drove to Anchorage, rented an apartment on Airbnb, and just hung out in the city for about five days. Up until that point we’d been camping for over two months and had slept in hotel rooms for only 3 nights! So it was a kind of vacation from our vacation, a time to simply relax and not think about hiking or camping or photos. The highlight of our stay in Anchorage must have been the Glacier Brewhouse; all throughout the Pacific Northwest and Canada on this trip I’d been enjoying fine craft beers, and this place might have had the best! 5 days of restaurants and breweries (and showers) in Anchorage had us all rested and fattened up for further adventures, so we hit the road again. Alaska still had rainy forecasts, so we finally abandoned all our Alaskan backpacking plans we’d hoped to do this summer, and headed east back towards the Yukon where the weather would hopefully be better. 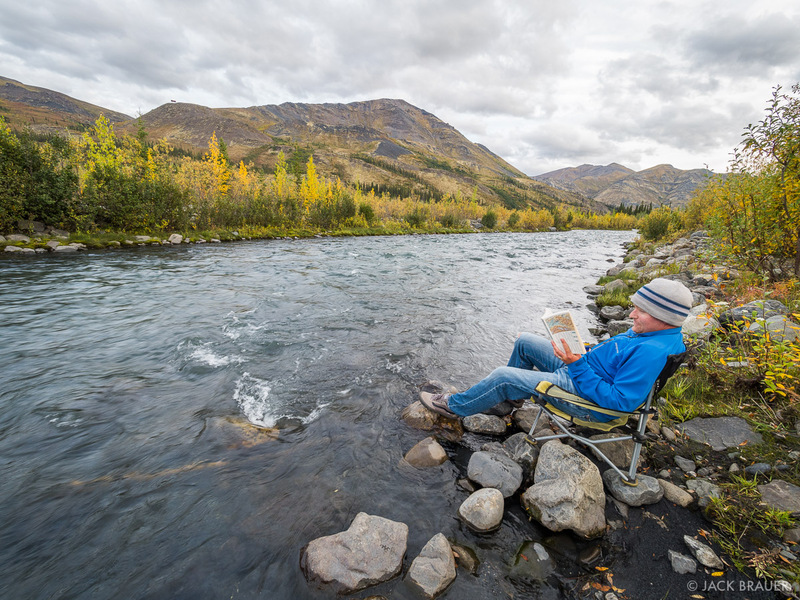 We drove the fantastically mountainous Glennallen Highway through Alaska, then the airy Top of the World Highway to Dawson, and finally made it to the destination we had in mind: Tombstone Territorial Park in the northern Yukon almost near the Arctic Circle. The only problem? A forecast of rain there too! We really wanted to backpack in the Tombstones in decent weather, so we figured we’d just kill some time and hang around there for about a week just camping out, doing day hikes, and generally just relaxing some more. A nice camp patio along the North Klondike River. The official Tombstone campground was full but we found a great spot to basecamp for the week at an empty highway-maintainence lot along the Dempster Highway right next to the North Klondike River. Like most random camping we did this summer, the random unofficial spots almost always turn out to be better than any campground! It was also a fitting place to sip on Yukon Gold beer while reading John McPhee’s Coming Into The Country, which is in large part about the region of Alaska we had just traveled through. It’s all about people living off the land in the wilds of Alaska, and the changing social and political dynamics of the 1970’s that spelled the demise of that way of life. I also enjoyed Jack London’s Burning Daylight, a novel about a miner who struck it rich in the Klondike and founded Dawson City. Overlooking the ‘Alpine Lakes’ near Fold Mountain in Tombstone Territorial Park. During one of the first days there we bushwhacked directly from our camp spot up one of the random big mountains above the highway. I think it’s called Fold Mountain, and we made it to a high ridge with a nice view overlooking some creatively-named lakes called “Alpine Lakes”. 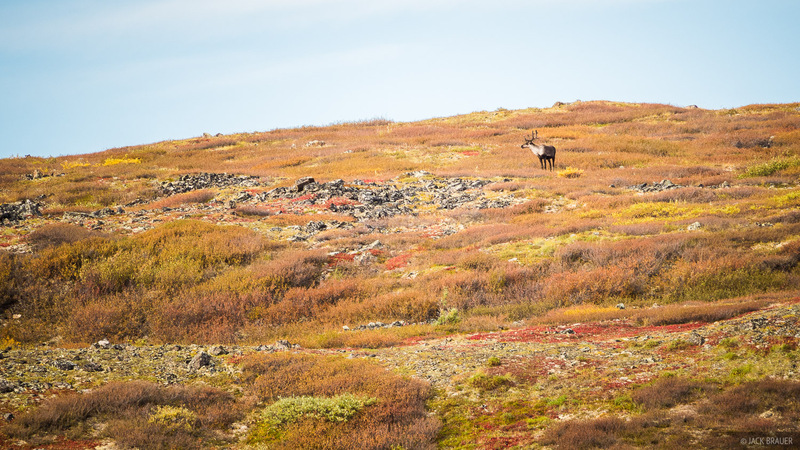 A lone caribou on the tundra high above the North Klondike River – August. 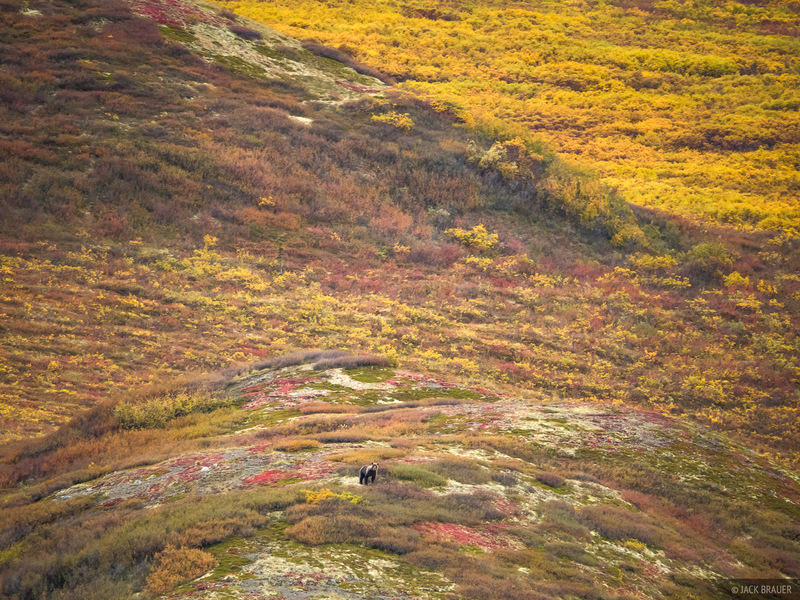 A grizzly bear wanders over the tundra eating berries in the North Klondike River valley – August. 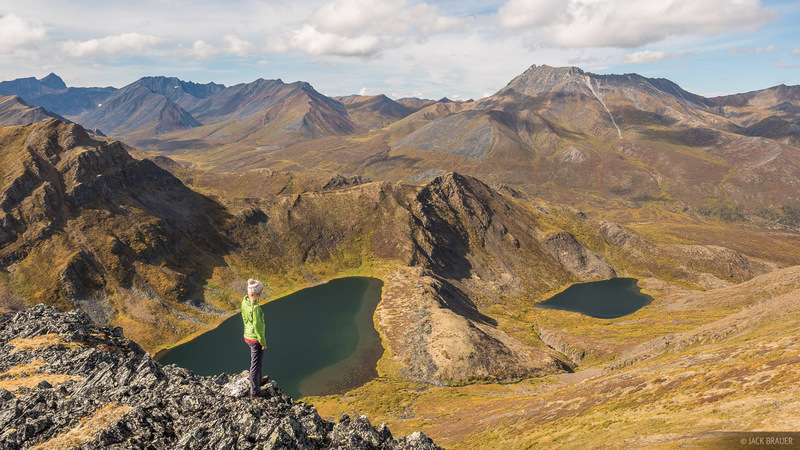 On another day we were hanging out at the famous Tombstone Mountain Viewpoint (where I took the top photo above) along the Dempster Highway when a lady came over and told us she spotted a bear across the valley. We watched the grizzly for a while as it wandered around on the tundra hoovering up berries. 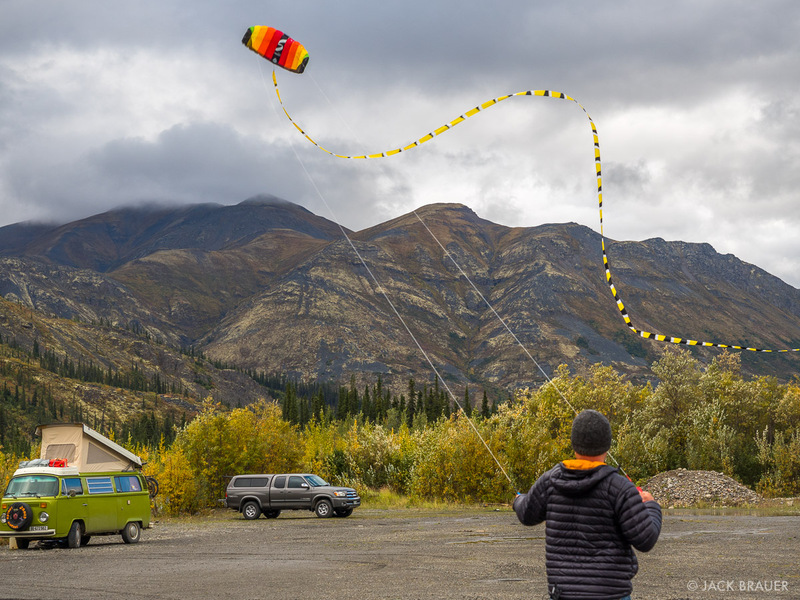 Flying a kite along the Klondike. Between rain squalls when it was windy enough, I had a blast flying my kite around. When it’s really windy I hook up a 100-foot streamer tail which makes it even more fun to fly — the tail tracks the path of the kite, tracing all its turns and loops through the sky. Our fellow parking lot campers there were from Switzerland and have been traveling the globe in that van for something like 2-3 years so far — all through Europe and Asia, now North America and eventually South America. I’m not sure if I’ve got the vagabond stamina to travel for that long; my limit is about 2-3 months, any longer than that and I usually start dreaming of getting back home to Colorado! View from the truck while waiting out rain. Though we kept ourselves relatively busy for the first half of the week, during the last few days of the week we spent much of the time sitting in the back of the truck watching it rain. And rain. And rain. I was a little jealous of the van with the pop top. These are the kind of days when there’s nothing to do but sleep in as long as you possibly can, then read for as long as you can, try not to start drinking beer too early, hope the rain stops long enough to eventually cook dinner, and just basically vegetate until it gets dark and you go to bed again. Posted in Road Trip 2016 and tagged Canada, Tombstones, Yukon on August 26, 2016 November 7, 2016 by Jack Brauer. When Denali is covered in clouds (which is most of the time) you can’t tell where the peak is or how big it is. 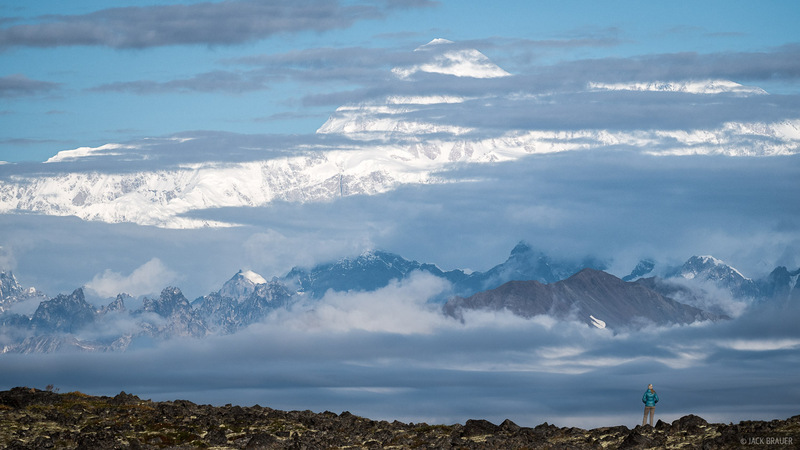 But when the clouds break up and Denali emerges, its massive scale is mind-boggling, like a Himalayan peak got misplaced in Alaska. This is the view from Kesugi Ridge in Denali State Park. In mid-August after looking at rainy forecasts in Alaska for weeks, there was finally a one-day window of sun in the weather forecast. We high-tailed it towards Denali and went on a quick one-night backpack trip up Kesugi Ridge, in Denali State Park just across the valley from Denali National Park. With clear weather the view of Denali from Kesugi Ridge is supposedly amazing; the question was, would the weather forecast pan out and the clouds clear enough for us to see the big peak? Posted in Alaska, Backpacking & Trekking, Road Trip 2016 on August 17, 2016 November 7, 2016 by Jack Brauer. Sunrise along Slims River, Kluane National Park in the Yukon, Canada. Cozy tent above the cold Kaskawulsh Glacier, Kluane National Park. 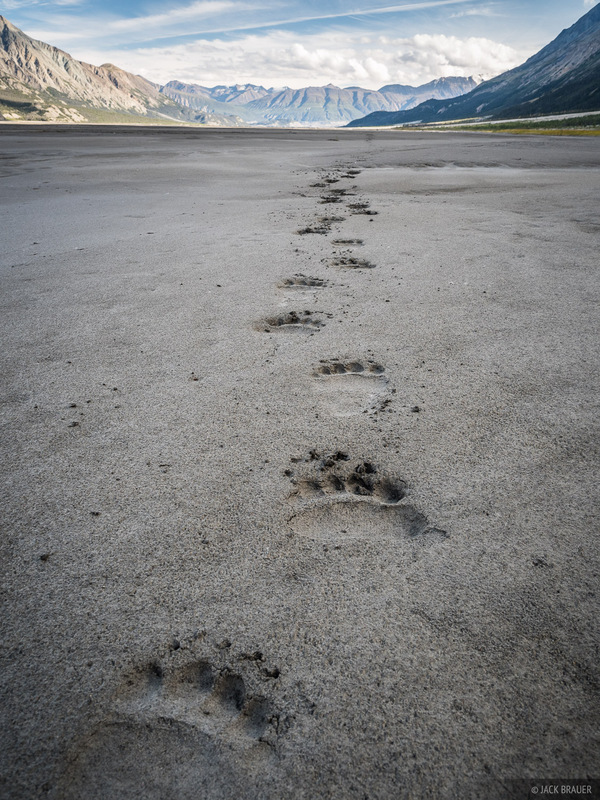 Following fresh grizzly bear tracks up the Slims River valley. After hiking up King’s Throne near Kathleen Lake, we were starting to get excited about the possibility of doing a backpacking trip in Kluane National Park. (Pronounced: “clue on ee”). Plus, we still had a pretty good weather forecast in the Haines Junction and Kluane area of southwest Yukon, while all of Alaska still looked rainy. So we headed out for a three night trek along the west side of Slim’s River to the Kaskawush Glacier and back. With all the grizzly tracks, river crossings, the glacial valley, desolate mountains, and trailless miles, this trek definitely felt quite wild. 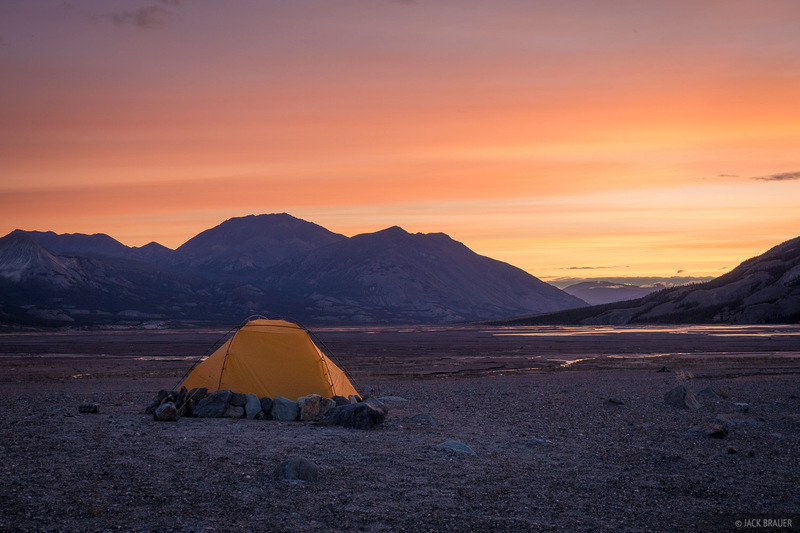 And although a week prior we had never even heard of Kluane National Park, our memorable trek here ended up being one of the highlights of our summer! 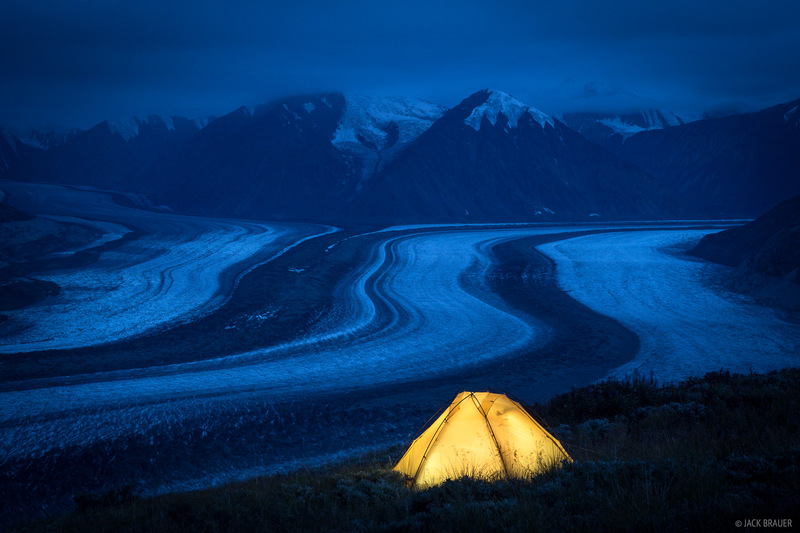 Posted in Backpacking & Trekking, Road Trip 2016 and tagged Canada, Kluane, Yukon on August 11, 2016 November 7, 2016 by Jack Brauer. Sunset over Kathleen Lake and King’s Throne mountain — Kluane National Park, Yukon, Canada. When we drove through Haines Junction in the southern Yukon on our way to Haines, Alaska, we couldn’t help but notice the big mountain range rising above the highway. I didn’t think much about it on the way in, but when we left Haines I thought maybe we should check those mountains out since the weather forecast was looking better over that way. What I didn’t even realize at first is that those mountains are part of Kluane National Park! I’d never even heard of that park, but it turned out to be a highlight of our trip… and we almost just drove right by without realizing it. View from the summit of King’s Throne, overlooking Kathleen Lake. We spent a night at the Kathleen Lake campground, then the next day hiked up to the summit of the King’s Throne mountain, which provided an awesome view over the turquoise waters of Kathleen Lake all the way back to the huge glaciated peaks near Mount Logan. The wind was howling like a freight train up there and got even stronger as we descended the peak. Combined with the slippery steep pebble-strewn trail, it was quite a struggle to get back down! Posted in Road Trip 2016 and tagged Canada, Kluane, Yukon on August 9, 2016 November 7, 2016 by Jack Brauer. Fort Seward in Haines, Alaska, with the Chilkat Range towering behind – August. Four months or so after my week of heli-riding in Haines last winter, in early August I found myself back in Haines! I hadn’t planned to return here on this trip, but with a crappy weather forecast everywhere else in Alaska besides Haines, we figured it’d be a good place to hang out for a few days and wait out the rain. It was pretty cool to see these mountains again, though I must say I prefer them smothered in snow! 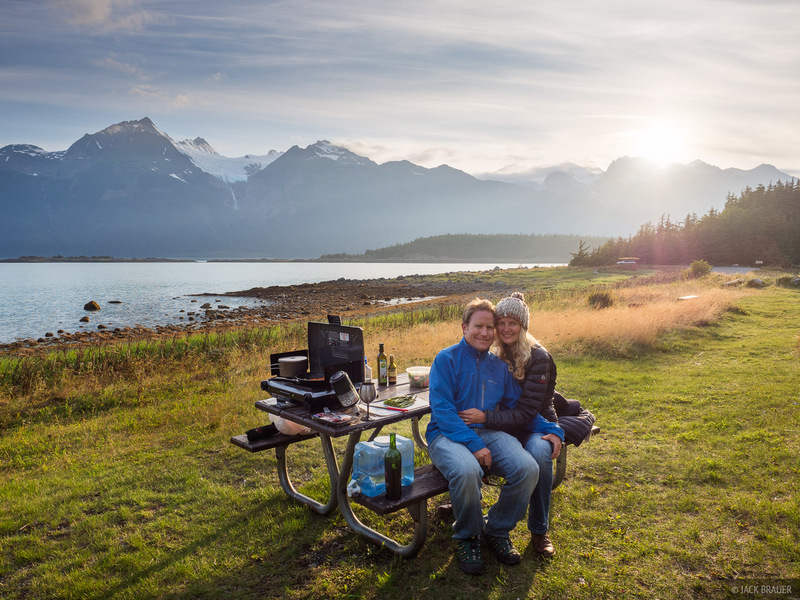 Celebrating our 4th anniversary with a gourmet dinner and some vino at Chilkat State Park. A panoramic view from atop Mount Riley, looking northwest towards the town of Haines. The Chilkat Inlet is on the left, the Chilkoot Inlet on the right. 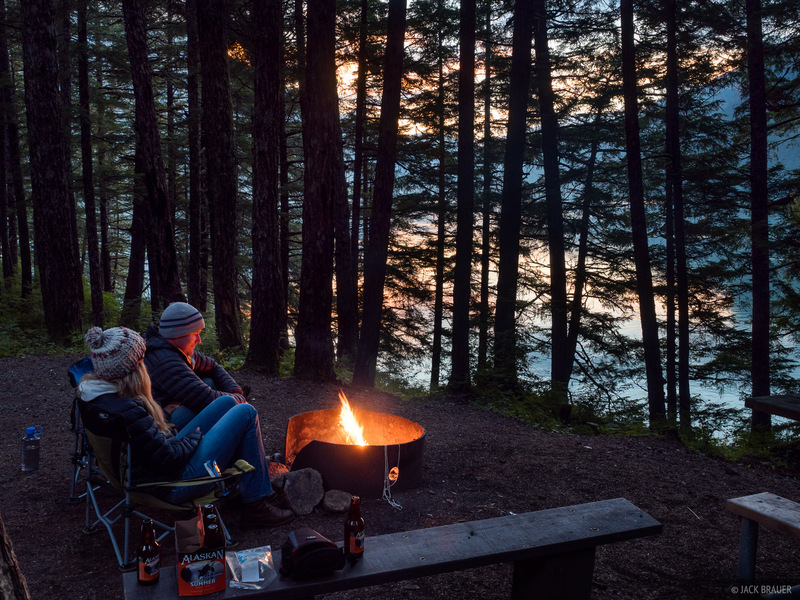 Campfire at Chilkoot Lake campground near Haines. 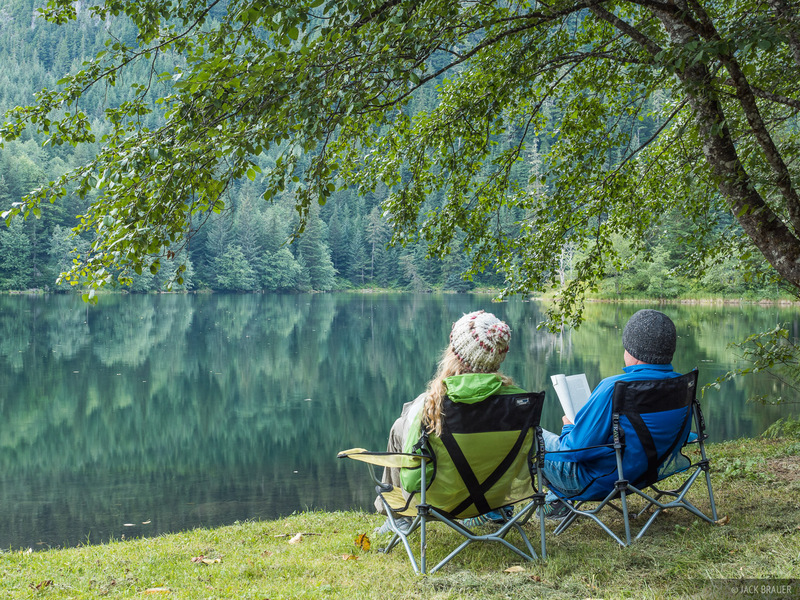 So, I have a funny story from our stay at Chilkoot Lake campground. On one morning we were sitting there at our campsite which was on a short but steep hill above Chilkoot Lake — pretty much the same place in the pic above. I hear lots of splashing down in the water and think: Uh, what’s that? I stand up and peek over the edge of the hill, and I see three big brown animals, one of which is heading up the hill right towards me. A bear, of course! I shout to Claudia and gather up my camera and the poundcake we were having for breakfast and stuff it in the back of our truck as quickly as possible. While I’m doing this, the grizzly (probably an adolescent, medium sized) has walked right past our abandoned camp chairs, about 20 or 30 feet from us, looking at me as if to say “What treats have YOU got for me?”. With the cake put away in the truck, I guess I looked like too much of a hassle for the bear, and it moseyed out of our campsite to check out more of the campground. A glimpse of the grizzly bear that scared us out of our seats at our campsite above Chilkoot Lake. 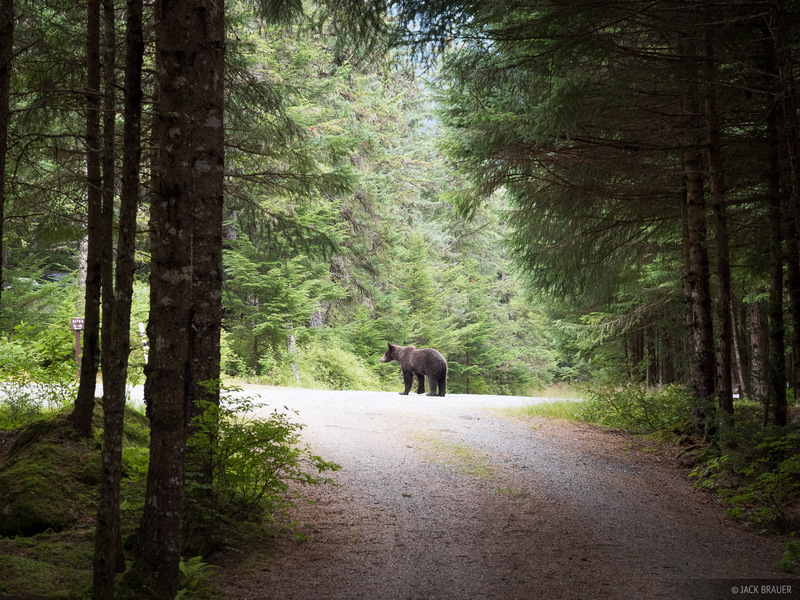 With the campground situated right on the lake between the Chilkoot River and a salmon spawning creek, these bear encounters are fairly common. Our little brush with that bear was a great reminder of just how important it is to keep a clean and tidy campsite! It doesn’t matter if you’re there to watch, if you have a big spread of food laid out, the bear’s just going to scare you off and help himself! 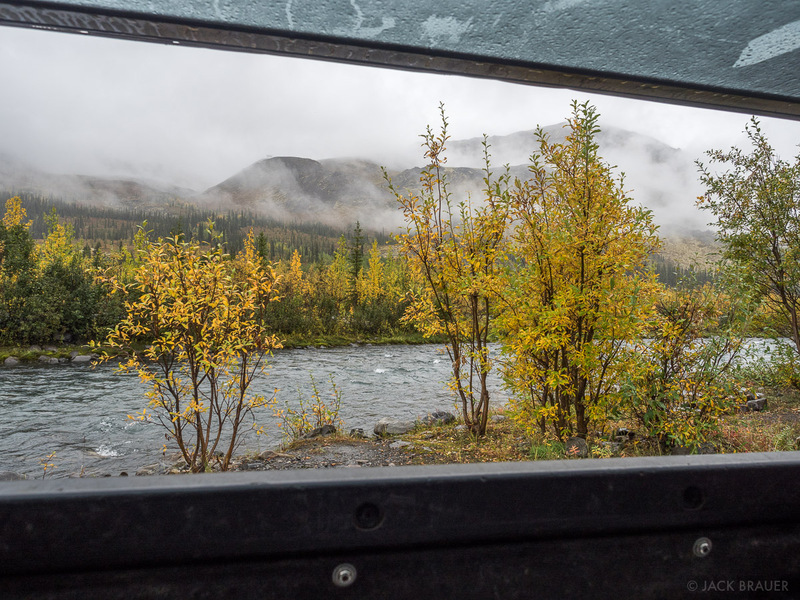 Anyhow, after about four days in Haines it started raining there too so we thought we’d drive over the border back into the Yukon and see if we could catch some decent weather there. Posted in Alaska, Road Trip 2016 and tagged Alaska, Haines on August 5, 2016 November 7, 2016 by Jack Brauer. 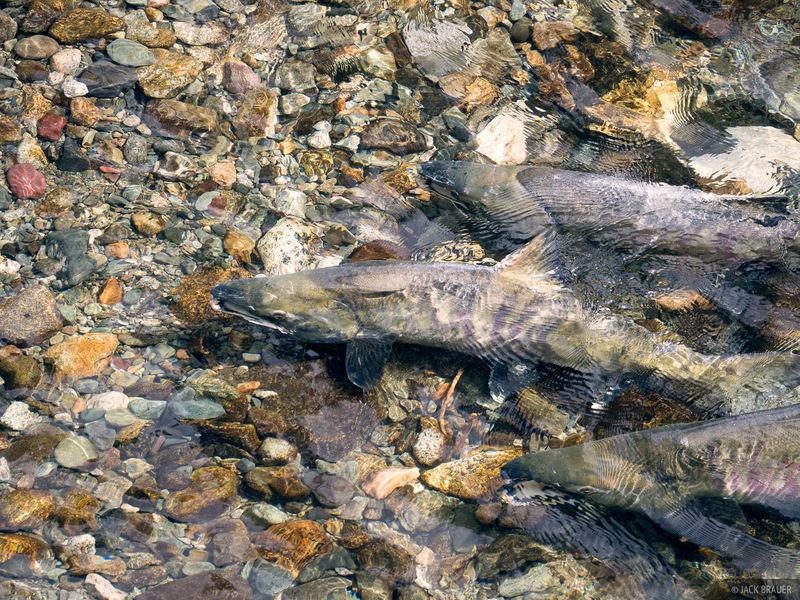 Spawning chum salmon in Fish Creek, Hyder, Alaska. 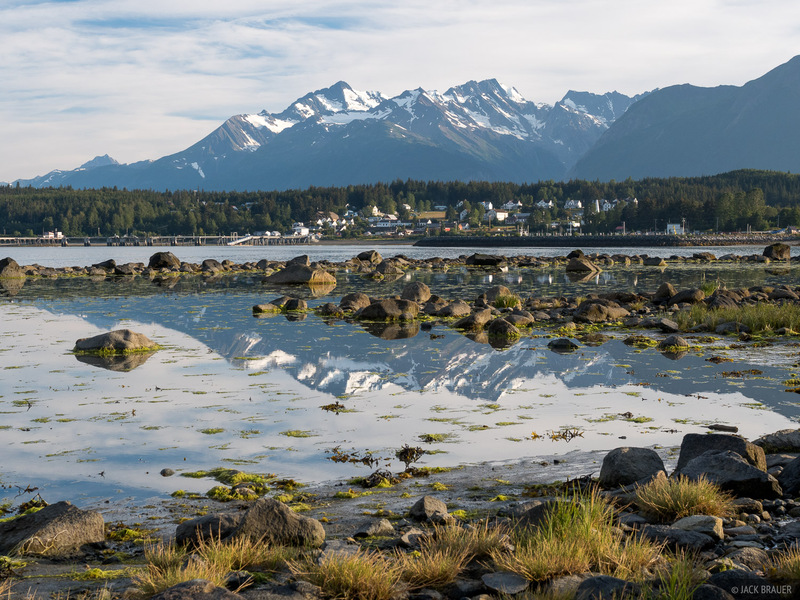 After bailing from Jasper and the Canadian Rockies, three days of driving west and north through British Columbia brought us to the southeast tip of Alaska and the town of Hyder. 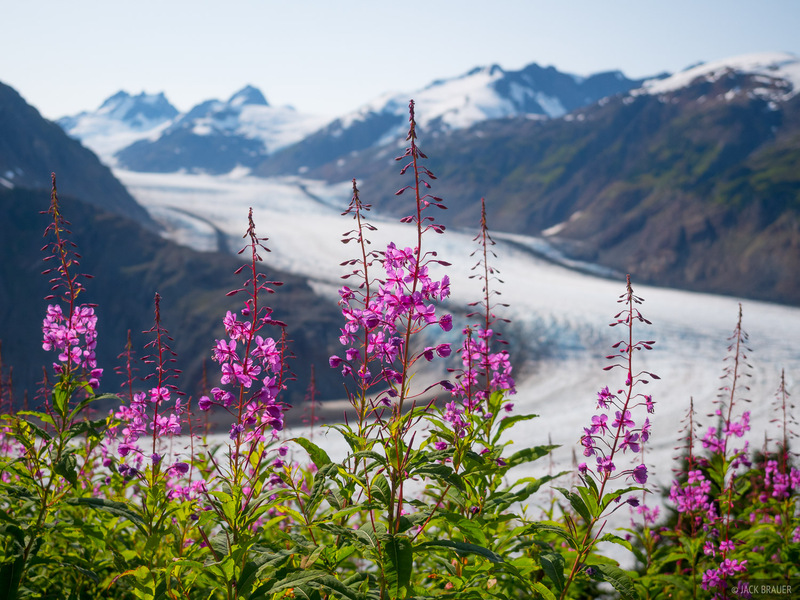 At this point in the trip we hadn’t really done any planning or research beforehand, so didn’t really know what to expect as we rolled into Stewart and Hyder, two towns straddling the border of BC and Alaska. If driving through the nearly-vertical, glacier-clad gorge to get here wasn’t spectacular enough, we got to see some grizzlies feeding on spawning salmon at Fish Creek right out of town! Grizzly bear hunting for salmon. Fish Creek was plump full of spawning chum salmon; you could hear their splashing before you could even see the river. There’s an elevated wooden observation path where you can walk above next to the river and watch as grizzlies occasionally come by to snack on salmon. I’m not really a wildlife photographer but it sure was fun watching the bear! 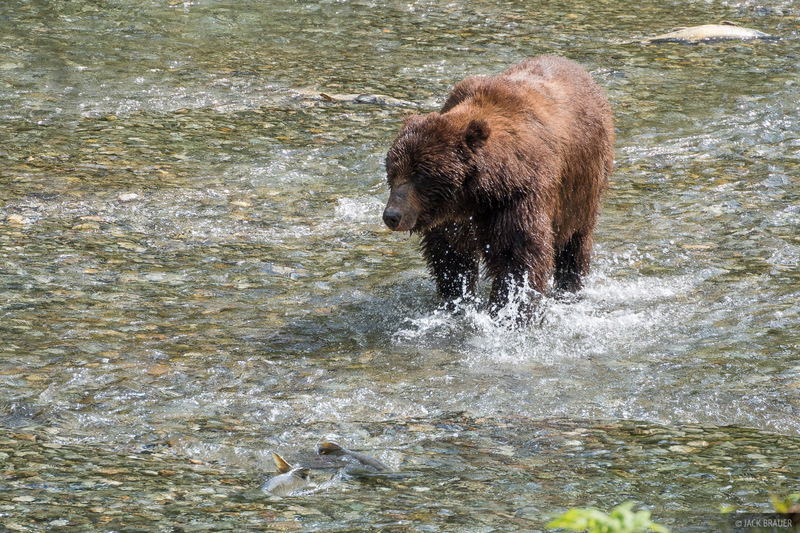 Grizzly bear picks up a chum salmon to eat. 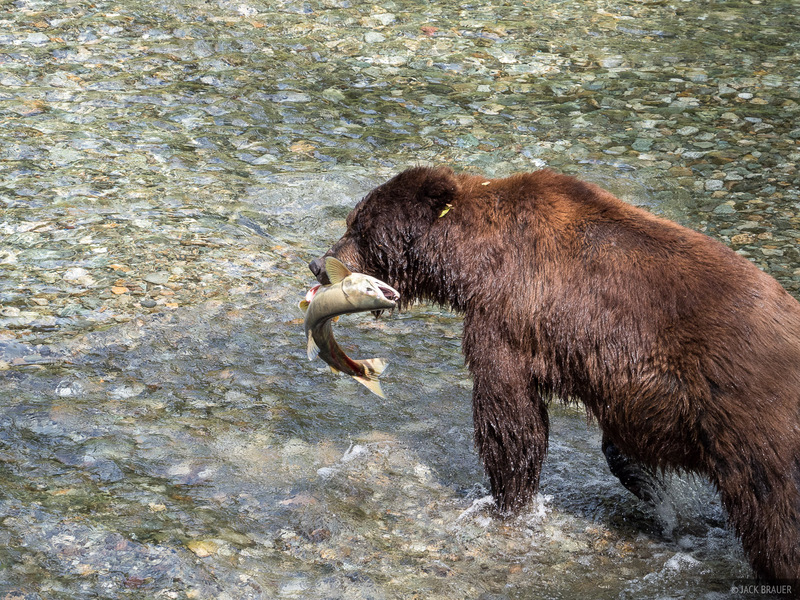 Interestingly, grizzlies usually just eat the skin and eggs of the salmon, leaving the rest of the fish to rot or be eaten by other animals. Sometimes the skinned salmon is still flopping around as the grizzly walks off with its skin! After watching the bears for a while we continued driving up the road from Hyder. A long winding dirt mining road took us all the way along and above the giant Salmon Glacier, the fifth largest glacier in Canada. 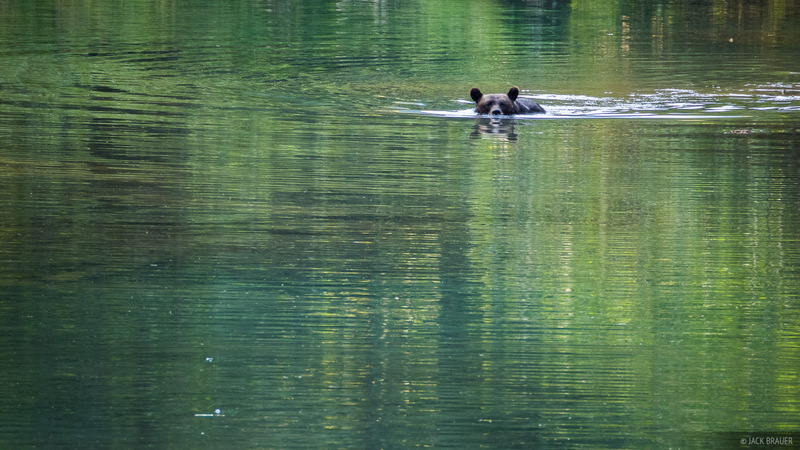 A grizzly bear swims across a pond. We drove down from the Salmon Glacier and stopped again at Fish Creek for one last look at the grizzlies, then returned to the Canadian side of the border, camped at a nearby little lake, and hoped that the grizzlies wouldn’t feed on us that night! A quiet evening at Clements Lake, near Stewart, BC. Posted in Alaska, Road Trip 2016 and tagged Alaska, Canada on August 1, 2016 November 7, 2016 by Jack Brauer. Dayhiking in Banff National Park + Bonus Rant! A spectacular view of Pinnacle Mountain on the way up Mount Temple. Looking southwest from near the summit of Mount Temple. Pinnacle Mountain and Eiffel Peak are in the center, Deltaform Mountain is the triangular one on the left, Mount Hungabee on the right. The rugged peak in the left distance is Mount Goodsir. Not only area all these peaks around here incredibly rugged, but they have a very unique and attractive character as well. 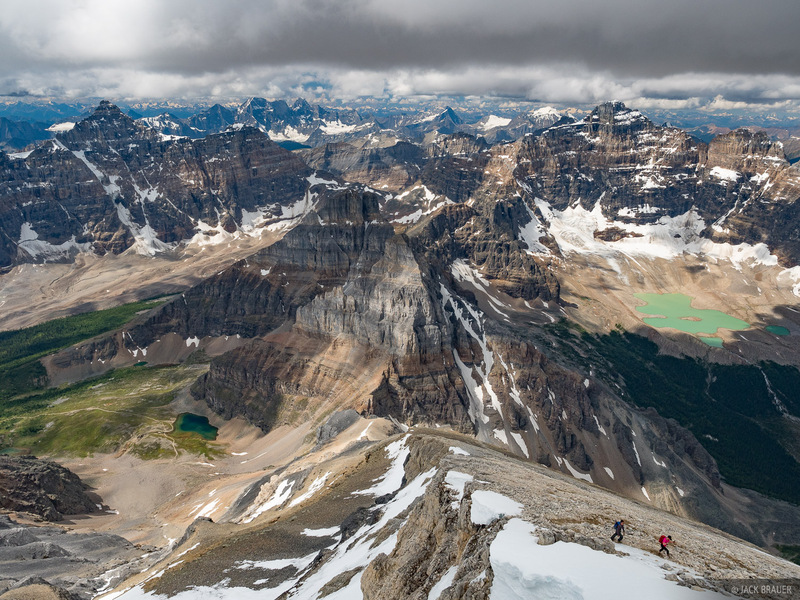 On the summit of Fairview Mountain (9002 ft / 2744 m), high above Lake Louise, looking towards Haddo Peak, Mount Aberdeen, Mount Lefroy, and Mount Victoria. Towards the end of July after our fantastic trek in the Height of the Rockies Provincial Park we ventured on to Banff, in the heart of the Canadian Rockies. 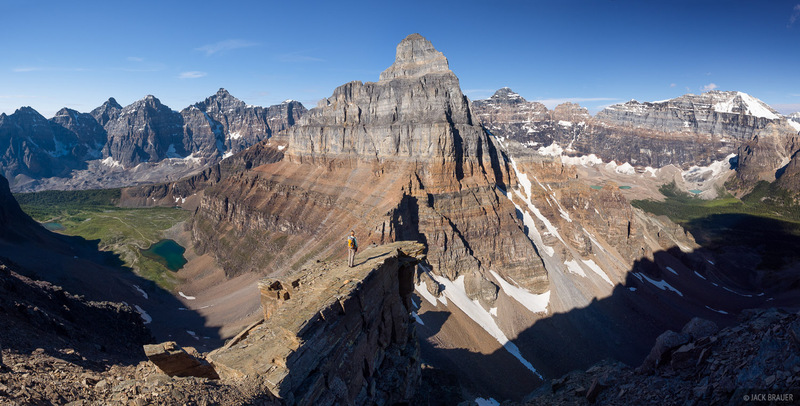 The Canadian Rockies are undoubtedly some of the most impressive mountains on the planet, like a mix of the rugged spires of the Dolomites and the wilds of Alaska or Montana. As you drive down the highways it’s just hit after hit, one awesome mountain after another. We had hopes to do some backpacking treks in Banff and Jasper National Parks, but unfortunately this proved to be nearly impossible due to a stifling new 100% backcountry reservation policy now in effect in those parks (read my rant about that at the link below). So, with no option to do any of the treks we wanted to do, we spent our time doing some day hikes instead before moving on. Posted in Road Trip 2016 and tagged Canada, Canadian Rockies on July 27, 2016 November 7, 2016 by Jack Brauer.